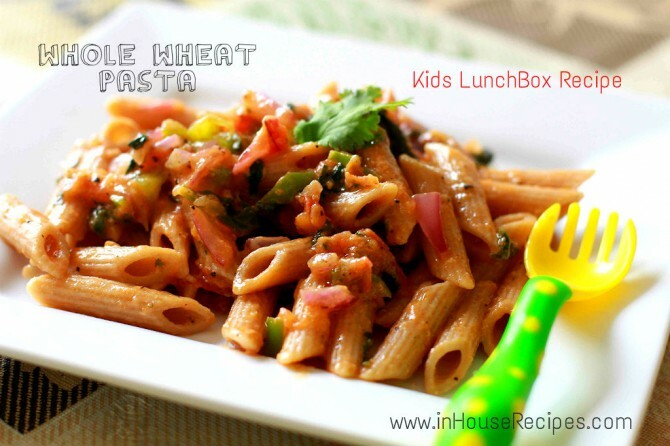 Whole Wheat pasta is a healthy and fiber rich version of white pasta. Our tried and tested recipe will help enrich your kid's lunchbox. Tasty and filling. Pasta brings smiles to a lot of faces including Maahi. She is fond of this Italian dish but in an Indianized way. (Read White pasta Indian style recipe). Normally, the pasta we get in restaurant is made out of white pasta or you can say the one made with refined flour (Maida). Here in this recipe, we have tried to give it a thumbs-up for health by using the whole wheat pasta. This certainly would make it a good snack deal for your kids! Here is the tried and tested recipe straight from our inHouseRecipes kitchen. Take a big pan. Add water and bring it to boil on high flame. After a boil, turn the stove to low flame. Now add Salt, Oil and Penne Pasta. Mix well. Cook until pasta gets soft and tender to eat approximately 15 minute. To test the pasta’s softness, take out one Penne pasta piece and pinch it. If it cuts easily, it is cooked. If does not, it may need 2-3 more minutes on stove. Note: Do not overcook the pasta. All stoves are not same. As per our experiments, 15 minutes is the optimum time for softening pasta. It may take a bit more or bit less on your specific stove. You know your stove better than us . Isn’t it? Take a frying pan and add Oil. Heat Oil on high flame for about 30 seconds. Now add Onions and cook them until they are translucent, on medium flame. Once done, add Bell Pepper and cook it for 1 minute. After a minute, add Tomatoes and mix well. Now its time to add Salt and black Pepper. Let this cook for 2 minutes. After 2 minutes on cooking, add Pasta. Mix well. Add Green chilies, Tomato sauce and Red Chili Flakes and Parmesan Cheese. Mix again and cover the pan with a lid. Let this cook for 2 more minutes. Once done, switch off the stove and garnish pasta with Coriander Leaves. It is always best to make fresh pasta and serve fresh. You can refrigerate it but it will most probably lose its shine and flavor. By cooking fresh, we certainly mean the second step where we actually roast the boiled pasta with the spices and vegetables. The first portion of boiling can be done in advance preparation as is the case with restaurants. Serve it hot and if possible and have energy and hunger, accompany it with the home made thin crust fresh whole wheat Pizza too!